Here is an easy way to convert your sourdough starter to an einkorn sourdough starter. You might want to have two starters, one for einkorn and one for regular sourdough and you can always dehydrate them so you’ll always have more starter. Gather ingredients and a jar that is large enough for your starter to expand and grow. Place 1 tablespoon of sourdough starter into your jar. Add 1/2 cup einkorn flour to jar and mix all the ingredients until all the flour is combined. Seal the jar with a lid and let it ferment for 6 – 8 hours. When you ready to bake bread take your starter from the fridge and feed your 1/4 cup starter, (discard if you have more starter than this) then add 1/2 cup flour to your jar; add a 1/4 cup water; stir well to combine until all the flour is incorporated and let sit for another 6- 8 hours until bubbly. If it’s not bubbly then feed it again (ratios above) every 6-8 hours until it’s bubbly. If your keeping your starter in the fridge then feed it once a week the ratio above. This will ensure that it will stay healthy and bubbly and you’ll only have to feed it once before your bake with it. 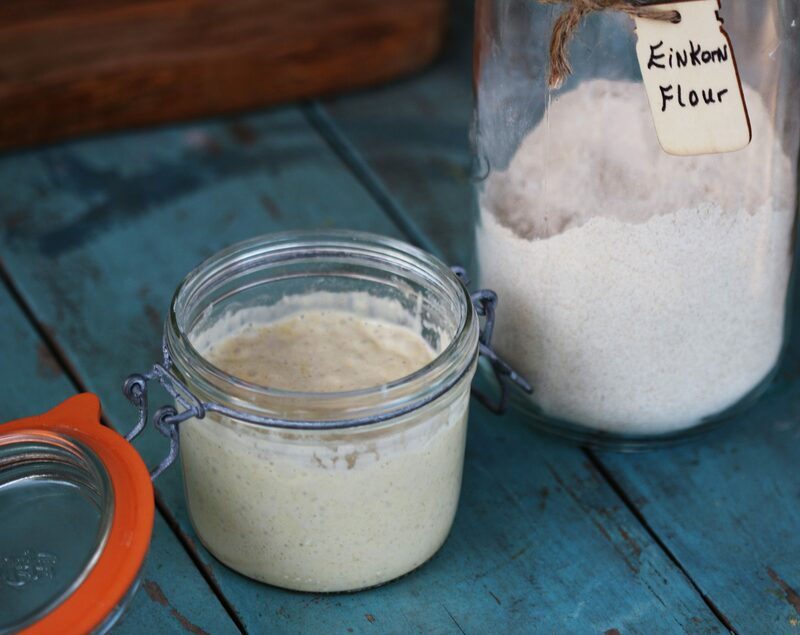 You can use Einkorn All-Purpose Flour or Einkorn Whole Wheat Flour to feed your starter. They both work equally well to rise your sourdough bread. The Einkorn Whole Wheat Flour will be more bubbly since it contains more minerals than Einkorn All-Purpose Flour. A whole wheat starter will ferment faster than Einkorn All-Purpose Flour and is more thirsty (give it an extra tablespoon of water if your starter is too thick) but they both work really well to make your bread. My recipes use Einkorn All-Purpose Flour to make the bread since it makes for a lighter, fluffier, and higher rising loaf.